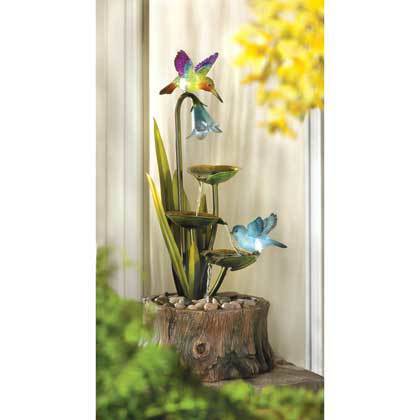 HUMMINGBIRD HAVEN FOUNTAIN by Cascading Fountains home decor, jewelry, decor, decorations, electronics, fountains, floor mats, art glass, vases, garden essentials, fireplace screens. There's only one way to describe this fountain: absolutely breathtaking! This stunning show of motion and light is sure to be the showpiece of your garden both day and night, with luminescent lights bringing the birds to glowing life. 120V submersible water pump included. Material(s): METAL RESIN PLASTIC LED LIGHT. Weight 9.8 pounds. Dimensions 11" x 10.5" x 22.2".